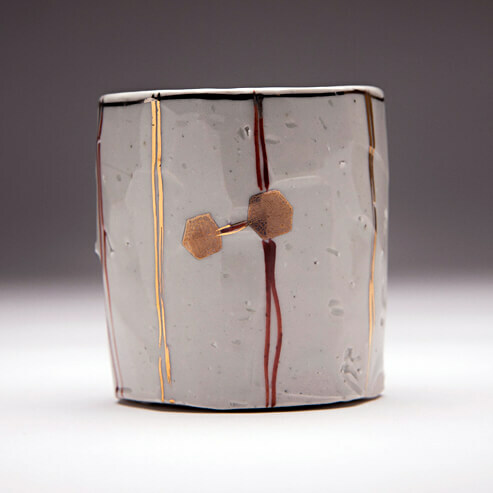 Trent Burkett is a potter, sculptor, and professor of art. He is currently an Associate Professor of Ceramics and Sculpture at University of the Pacific in Stockton, CA. Burkett was born in San Bernadino, CA in 1970. He was raised all over the US, yet has spent a majority of his life in Sacramento, CA. He completed his MFA in Ceramics at the University of Minnesota, Twin Cities, and his MA and BA at Sacramento State University, CA. Burkett has established himself as a nationally exhibiting artist based in the California Central Valley. He continues to build on his current successes in teaching, creative research, and sharing his pottery and sculpture with a vigilant audience. One can view his work at Trax Gallery, Berkeley, CA; JayJay Gallery, Sacramento, CA; The Museum of Craft and Design Store, San Francisco, CA; the Signature Shop and Gallery, Atlanta, GA, and Stewart Kummer Gallery, Guallala, CA. My work is influenced by a convergence of childhood experiences traveling in the Sierra Nevada landscape and an understanding of Eastern aesthetics through my art education. Exposure to these influences were first imparted by my father who spent much of his early life in Taiwan. His appreciation for Asian culture through food, films, and spirituality was a theme for many of our activities. One of our longstanding traditions was an annual backpacking trip into the Sierra Nevada Mountain Range. This world of granite, water, and flora played a formative role in the development of my values and beliefs. My subsequent education in the Arts provided a deeper understanding of Eastern philosophies through the study of the Ceramic Arts of Japan and Korea, where evidence of rugged essentialism and the acceptance of the unexpected are expressed in utilitarian objects. My appreciation for functional objects ranges from the strictly everyday use of objects to the more eccentric and sculptural aspects of experiencing objects. Their use can become obscured and inter-changed. My aesthetic incorporates the use of forms and surface which employ organic/gestural qualities as well as architectural/human invented forms. In this regard, I attempt to create a dialogue between sculptural and utilitarian ideas. My experience with wood and salt-fired ceramics is important to my aesthetic goals. These atmospheric processes of firing have helped to solidify my understanding of the relationship between form, material, surface, and the traditions of fire. Currently, I dig and process found clays in the foothills of the Sierra Nevada. I process the clays by hand and experiment by using them as components in simple clay bodies as well as in forming slips and glazes. For the last couple of years, I have turned to working with a white porcelain body, clear glaze, and china paints. I also work with mixed-media to create singular objects as well as installations. The use of space and light are also key elements in my sculptural work and I tend to lean on more formal modes of expression rather than relying on narrative.